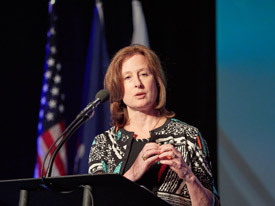 Kate Adams, Honeywell’s senior vice president and general counsel, recently shared the story of the successful restoration of Onondaga Lake during her keynote address at CenterState CEO’s 2017 Annual Meeting. The luncheon was held at the Nicholas J. Pirro Convention Center in Syracuse. It is Central New York’s largest annual gathering of business and community leaders. Kate Adams, Honeywell senior vice president and general counsel, delivering the keynote address. “I want to congratulate the people at Honeywell, who have worked with the New York State Department of Environmental Conservation and with local government to make sure that the next generations will know Syracuse as ‘the city on the lake’ in Central New York,” said New York State Lieutenant Governor Kathy Hochul. During the event, Adams announced that the dredging and capping of Onondaga Lake are now complete. She reflected on the achievements, energy, expertise, and passion of the team that engaged in groundbreaking collaborative work on the largest sediment cleanup in the country. In addition, she spoke about Honeywell’s focus on technical excellence, dialogue with regulators, community engagement, corporate citizenship, and an unwavering goal to bring the best science to the lake cleanup. Adams also mentioned that federal and state agencies recently announced 20 new projects designed to increase public access, provide new fishing piers and boat docks, and enhance and preserve about 1,400 acres of valuable habitat in the Onondaga Lake watershed. One of the projects includes extending the Erie Canalway Trail from Camillus to the western shoreline and would continue the extension of the Onondaga Lake Loop the Lake Trail. Left: Wetlands along Onondaga Lake’s western shoreline have been restored. In 2015, Onondaga County opened the Lakeview Amphitheater, an outdoor concert venue located on the shore of Onondaga Lake. Right: A Great Blue Heron catches a fish in the restored Geddes Brook wetlands. Habitat restoration, a major focus of the cleanup, continues in 2017. On the shores of Onondaga Lake and along the lake’s tributaries, Honeywell is improving 87 acres of wetlands and planting about 1.1 million native plants, shrubs, and trees. To date, 74 acres of wetlands have been created or enhanced and nearly 600,000 native plants, trees, and shrubs now provide diverse habitat for more than 230 wildlife species. Watch a video about the impact of the Onondaga Lake cleanup.